Even though I am a globe-trotting beer writer, one of the things I love most is boasting about my hometown’s craft beer scene. Since moving to Atlanta in ’94, I knew it would be a matter of time before the entire state of Georgia embraced the craft beer movement. Though I was initially welcomed by laws severely limiting ale and lager varieties, a decade of prayer and politicking has brought change. The most recent advancement was Georgia Gov. Nathan Deal signing Senate Bill 85 into law, permitting breweries and distilleries to sell directly to their consumers—including growlers and up to a case of product. As a result, another wave of breweries and brewpubs have surfaced in anticipation of this law’s economic impact. Just over a half-mile down East College Avenue is Three Taverns (121 New St.) where owner Brian Purcell has been pouring his outstanding renditions of Belgian ales, Russian imperial stouts, IPAs and sours from the taps of “The Parlour” inside his rustic-meets-chic brewery since 2013. Request anything from the Imaginarium, Hop Leaf and Sour Asylum Projects. Getting back on College Avenue, stop by Ale Yeah! (906 W. College Ave.) and browse through an expert-curated selection of craft cans, bottles, bombers and small bites like cheeses, pretzels and cured meats. And yep, there are growlers and a “build-your-own six-pack” option as well. There is also The Beer Growler (38A N. Avondale Road) in the Avondale Estates specializing in filling 32-and 64-ounce growlers to go from 42 taps. Now to turn it up a notch and head a mile east toward downtown Decatur. Twain’s Brewpub & Billiards (211 E. Trinity Place) has award-winning homebrewer-turned-brewmaster Mike Castagno providing at least eight rotating in-house beers and chef Ryan Burke making sure no one’s hungry with numerous edibles (including vegan and vegetarian). Add shuffleboard, darts, a full pool hall and TVs throughout, and boredom is virtually impossible. Crossing the street, the historic Decatur Square awaits with one of the most esteemed institutions in the craft beer industry, Brick Store Pub (125 E. Court Square). For two decades, beer aficionados worldwide have flocked here to choose from the 29 taps and beer engine downstairs, eight brews on rotation at the Belgian Bar upstairs, and a gawk-worthy cellar array of more than 900 vintages available from the menu of biblical proportions. 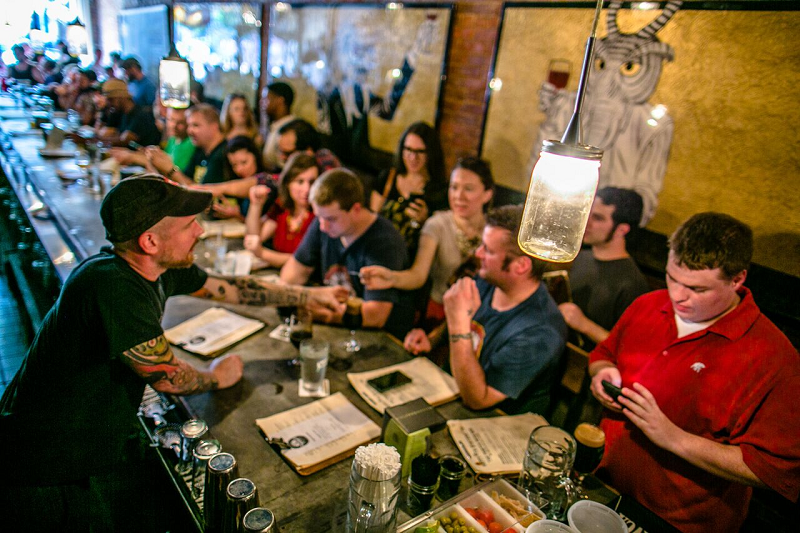 There are no TVs, all breweries have to fall under the Brewers Association’s strict craft beer specifications, and food is prepared with the freshest ingredients. Its gastropub sibling just around the corner, Leon’s Full Service (131 E. Ponce de Leon Ave.), is celebrated for its inventive cocktail program, but still offers an impressive list of hard-to-find craft beers. That’s Decatur, and what I consider an awesome Friday. Trusting a good sleep followed your unforgettable Decatur hop, a rebooting “hair of the dog” brunch menu awaits at The Porter Beer Bar (1156 Euclid Ave. NE) in the historic Old Fourth Ward just east of downtown Atlanta. Based in the bohemian-flavored shopping district called Little Five Points where ATL’s weird, hip, health-conscious and artistic types assemble, the Porter is one of Atlanta’s prime destinations for beer lovers. 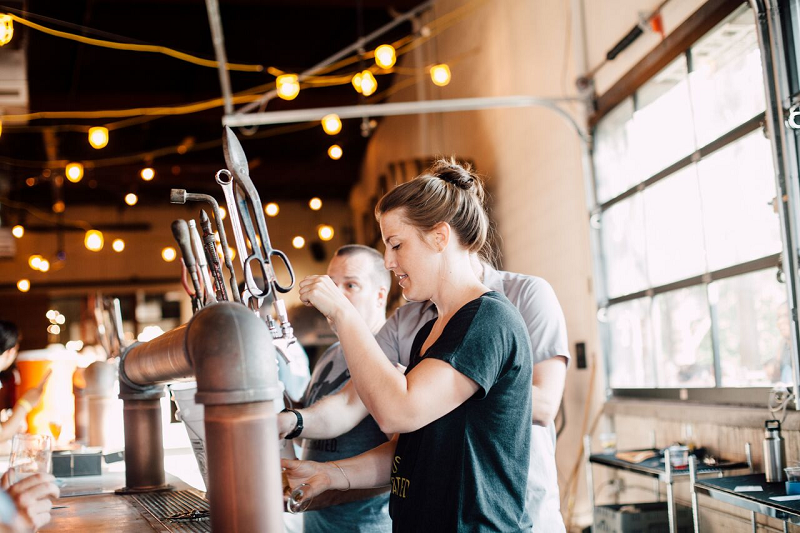 Husband-and-wife team Nick Rutherford and Molly Gunn—along with their knowledgeable staff—are in their ninth year serving more than 430 beers, top-shelf spirits and plates of award-winning fare sourced from local farms (including their own). Continuing 1.5 miles south, East Atlanta Village has two gems worth visiting. The airy, three-level Argosy (470 Flat Shoals Ave. SE) boasts an eye-popping interior that includes mural art, wood fixtures, a wood-fired pizza oven and a secluded Brigantine Beer Parlor and Recreation Hall in the back with a giant wooden squid suspended from its ceiling. Although the latter is usually open at night, take a gander; you can always come back for a late-night visit. (Note: Wrecking Bar and Argosy’s brunches are both lip-smackin’ good.) Stroll a block down to Midway Pub (552 Flat Shoals Ave. SE), an energetic neighborhood hangout ideal for watching sports (especially soccer and football) on numerous HD-TVs and projector screens, playing board games, chilling at the patio and Tiki bar, enjoying solid pub grub; and yes, consuming beer. Thirty-two rotating taps. And now it’s the Westside’s turn. Take an Uber or Lyft for 10 minutes and arrive at the new brewing location that rocked ATL’s beer scene in 2017. Monday Night Brewing (670 Trabert Ave. N.W.) hit the ground running with the introduction of its Eye Patch IPA and Drafty Kilt Scotch Ale in 2011; now, a second location specializing in barrel-aged brews and sours called The Garage (933 Lee St. SW) is the place to be. It’s a 20,000-square-foot fun factory along the Southwest Trail of the steadily aforementioned Atlanta BeltLine. As night sets in, hit up Ormsby’s (1170 Howell Mill Road). Everyone from Georgia Tech students and hipsters to businesspeople yearning to loosen their shirt buttons wine and dine on the first level’s restaurant. Downstairs is Atlanta’s most festive basement, with shuffleboard, billiards, darts, Skee-Ball, two bocce ball courts, board games and that rope, ring and hook thingy. An impressive draft list and delectable, upscale pub menu close this evening with an exclamation point. Take advantage of Atlanta traffic’s least-congested day of the week to bounce around a bit throughout the city. Reflect on your weekend so far by taking a walk along the eastside BeltLine starting at the Historic Fourth Ward Skatepark (830 Willoughby Way NE), appreciate the mural art on the way heading south, listen for cyclists trying to break the sound barrier. Then set up a tent (figuratively) at the camping ground-inspired Ladybird Grove and Mess Hall (684 John Wesley Dobbs Ave. NE) to sip a Creature Comforts Tropicália IPA (one of the few venues that have Georgia’s most popular IPA on draft virtually all the time) and Ladybird’s hearty brunch. Just make sure you set your taste buds to 12:30 p.m. for alcohol orders; it’s the state law on Sundays (I know, I know). From there, get back on the BeltLine and pass the skatepark until you get to the all-new New Realm Brewing Co. (550 Somerset Terrace NE) just before the Ponce de Leon Avenue bridge. It’s arguably Atlanta’s most anticipated brewery to open in years—plus the largest to ever open in Georgia—and the hype is justified. Stone Brewing Co.’s former brewmaster, Mitch Steele, brought his talents to Old Fourth Ward thanks to Realm’s 40,000 square feet brandishing a rooftop bar with a stunning skyline view, a lively beer garden to entice pedestrians and a 20,000-barrel capacity to make more than just phenomenal IPAs. Executive Chef Julio Delgado ensures you’re good if an appetite surfaces. 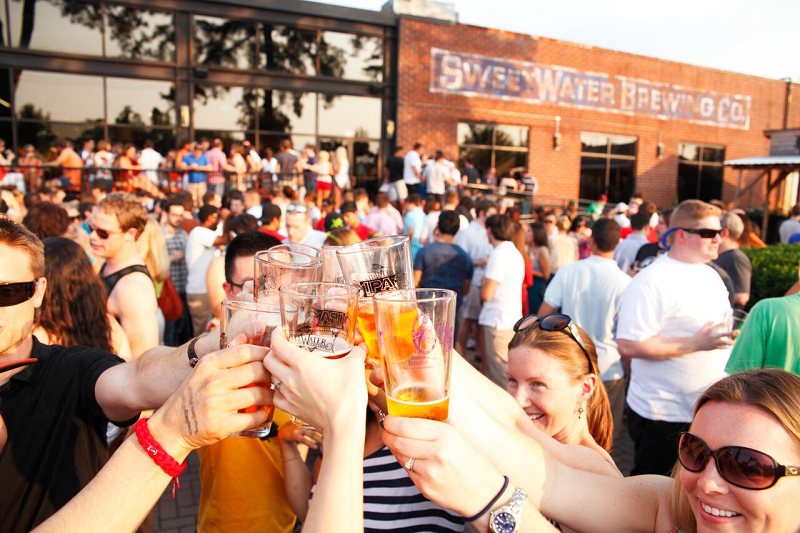 Next, it’s time to take a ride to Midtown and pay homage to the Southeast’s largest craft brewery, and by last count, 15th-largest in the U.S.— SweetWater Brewing Co. (195 Ottley Drive NE). Known for its edgy marketing, being one of the first to introduce West Coast styles to Atlanta, clean water initiatives, its one-and-done “Dank Tank” beer series and annual kickass 420 Fest, SweetWater is also the most enterprising since 1997. The brewery’s latest additions include the stunning barrel-aging facility called The Woodlands and a pilot system where longtime head brewer Nick Nock and his team have been diversifying the portfolio and crafting experimental beers exclusive to brewery visitors. Hungry? Hit up one of the more extraordinary beer andfood concepts on the East Coast called Hopstix (3404 Pierce Drive) in mushrooming Chamblee. It’s a brewpub serving solid house-crafted ales and lagers alongside local brewery selections, but what brings it over the top is the stellar Asian fusion-themed menu overseen by passionate executive chef Dony Raymond and prepared in an open kitchen. How many brewpubs have robata grilling, Alaskan king crab fried rice and a whole bluefin tuna being cut for tartare under the same roof as a brewhouse? Hopstix’s founder and brewer, Andy Tan, has wowed every guest since opening in early March of 2017. 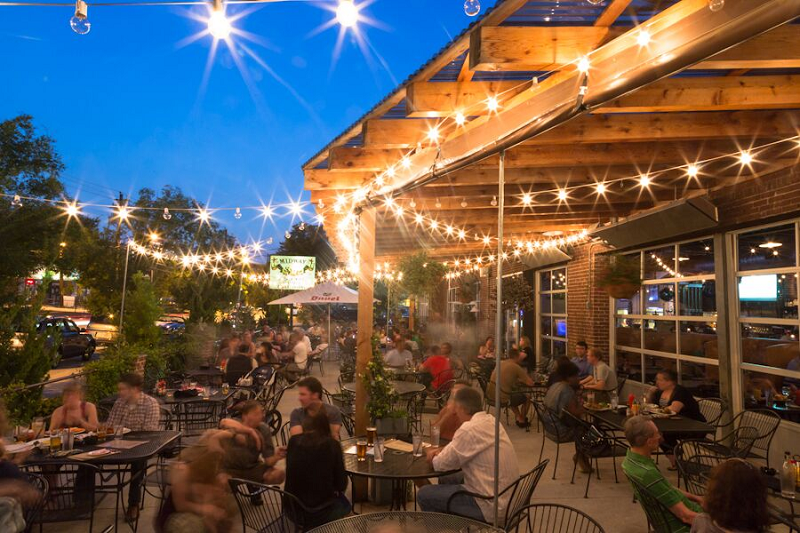 To conclude the evening, take a ride to The Chapter Room (5600 Roswell Road) in Sandy Springs on the northwest side to sip some of the most hard-to-find ales and lagers in the city. Based underneath one of Taco Mac’s tri-state restaurant franchise locations is its rendition of a speakeasy, complete with a buzzer and peephole. Once the metal door swings open, the interior is designed to mimic the inside of a barrel with posh leather seating, carpet, intimate lighting and an array of spirits setting the tone for the perfect toast-off to a spectacular beer weekend in ATL. It’s all about the amount of time you have in ATL, but the westside’s Scofflaw Brewing Co. (1738 MacArthur Blvd. NW) has become one of the fastest-growing breweries in the South due in part to its phenomenal IPAs and embracing of the now infectious “We-don’t-give-a-f#*k” mentality. Renowned brewmaster Travis Herman (formerly of Russian River) makes sure all of Georgia blissfully sips its array of delicious, mostly potent selections with an attitude. 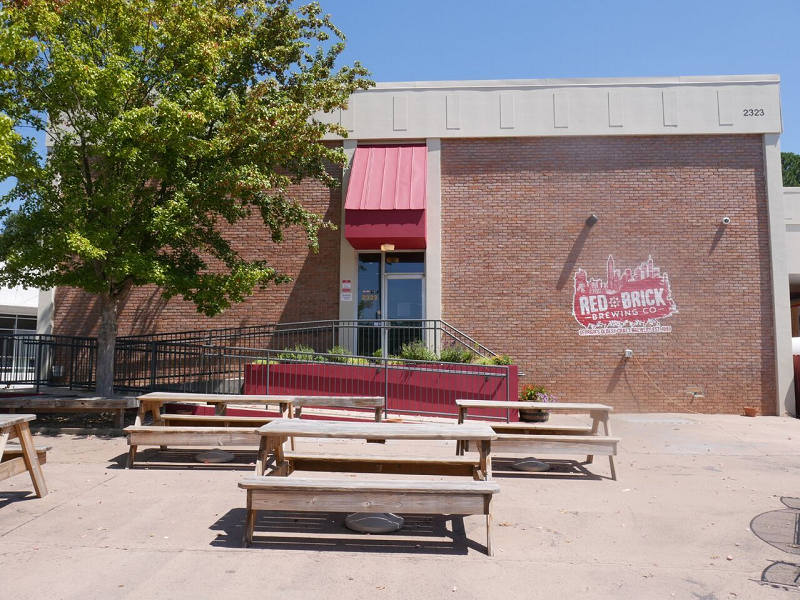 The oldest existing craft brewery in Georgia, Red Brick Brewing Co. (2323 Defoor Hills Rd. N.W. ), has also been impressive over the past few months after having Gavin McKenna take over the direction of operations. Its latest Journey Without Maps imperial IPA indicates good times are ahead. Dennis Malcolm Byron, a.k.a. Ale Sharpton, is a world-renowned beer authority, award-winning journalist, blogger (AleSharpton.com), photographer, event host and gourmand. Globetrot with him on Twitter and Instagram. No Jekyll Brewing? one of the better brews.